The Smith Mountain Laker is quite a nice regional magazine from Franklin County to our south. 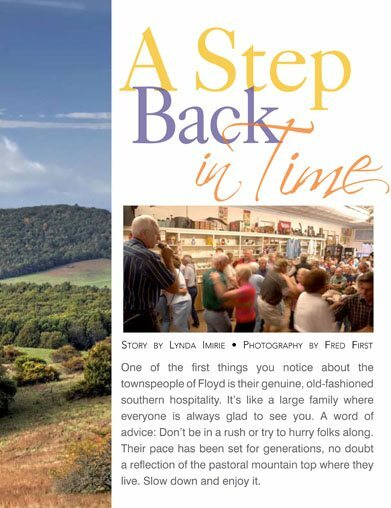 I was contacted by the editor back in the summer to see if I might contribute images toward a fall feature on Floyd County, Virginia, where I live. The editor was kind enough to send me the pages for the Floyd article and permission to post it for you to see at Scribd. All of these pictures in this piece save for the musicians (and the included cover) here are mine. I thought the article turned out very well. See the entire magazine online (pdf). Also Floyd-related, a (Roanoke) Star City Harbinger piece on local musician, Mike Mitchell. Nice article, Fred. Your photo of the mountain valley is spectacular! Congratulations! Always nice to see your work in print, isn’t it? Especially when it comes to highlighting the wonderful place in which you live. Previous Previous post: Today is Rock Flipping Day: Get Out There!